Language matters. Words, when spoken, have weight and a certain power. As birth workers we know this; the birthing person delivers the baby NOT the provider, midwives “catch” babies. The difference between “my care provider supported me through my VBAC” versus “my care provider allowed me to VBAC” is a very important one. As long as I have been involved in birth, I have felt very uneasy with the phrase “out of hospital birth”. In my mind, it makes the hospital the norm and centralizes the focus on the hospital as the standard location for birth. This is wrong! If we plan to take back birth from the dominant hospital based paradigm then we must move the focus from the hospital and put it back on the birthing family as the center of the process. Recently, I attended the 2015 MANA Conference in Albuquerque, NM. One night, I attended a benefit dinner for FAM and I heard a phrase that struck a powerful cord within my heart and soul. This phrase has continued to grow in my subconscious and is taking root. I think that we need to start a language revolution and begin to use this phrase in place of “out of hospital birth”. The history and philosophy of midwifery is based in the community; midwives view pregnancy and birth as a normal part of the life cycle. We see the Mother-Baby unit as a whole being in the context of their holistic framework. These things cannot be separated from the community; the entire family and the support circles that surround that family. I work at a free standing birth center and as such my clients and midwives are often inadvertently left out of the conversation. Our current culture uses “home birth” and “hospital birth” and of course the above mentioned “out of hospital birth”…which often is only associated with homebirth. All of these terms fail to recognize birth center birth and maintain a marginalization of all the options. So, what is this phrase?…. 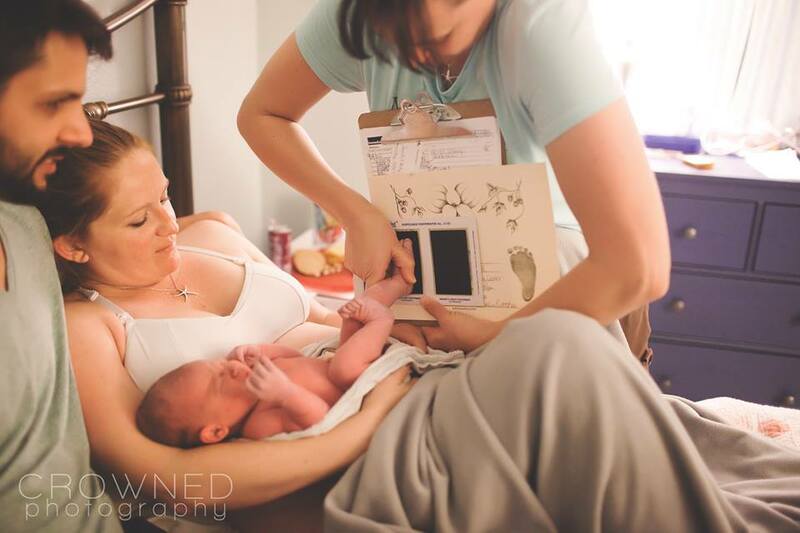 Community Birthing can encompass all the options that families may choose outside of the hospital. It does not utilize the hospital as the focus and therefor the norm. I plan to start using this term exclusively when referring to any birth that happens outside the hospital. No more “out of hospital” birth for me! What do you think? Care to join on this language revolution?…. I like community based birth and was honestly just thinking about this recently! I LOVE THIS!! As a Hypnobabies instructor our language is critical to our course. We try to create a new perception of birth because the language that is most commonly associated with it is so negative and clinical. We teach birthing parents that they BIRTH their babies, no matter the setting, instead of being DELIVERED by a doctor (afterall, pizzas are delivered, not babies). The phrase “out of hospital” irks me because it implies the birthing parent is making an unfavorable decision regarding where they decide to birth their baby. I will definitely share this. Thanks for your feedback. Yes, the whole “out of hospital” part has always bothered me too, it makes the hospital the central focus and not the woman or her family. Hypnobabies is definitely on board with the importance of language and the power that it can have. Thanks for reading and sharing! I love this “out of hospital birth” is always accompanied with a negative tone, which really rubs me the wrong way. Upon meeting our (soon to be ex)pediatrician, we were asked which hospital our daughter was born in. When I said she wasn’t born in a hospital, I received a look of disgust and a comment that implied that we weren’t good parents because we birthed at MMC. I mentioned that we chose a birth center and gave her Mmc’s stats… Her silence was precious. Chelsea, thanks! I am sorry your pediatrician behaved that way but I am glad that you were able to do some education!